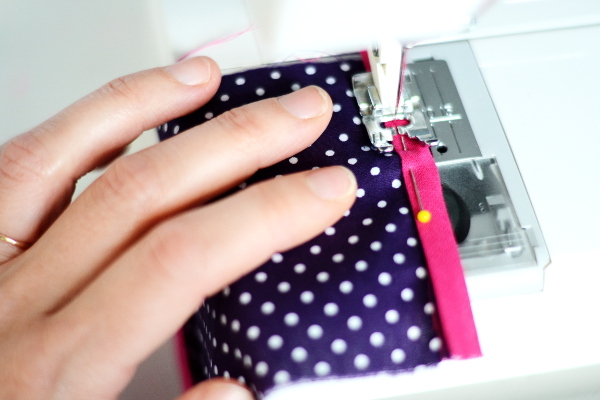 Today, I’m going to teach you how to apply bias tape, one of my favorite accessories. 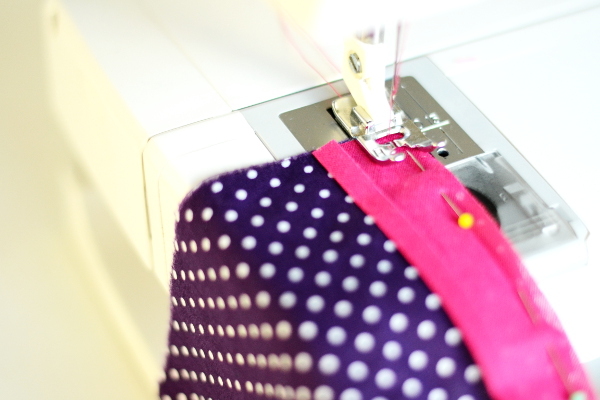 I use it as a fast way to finish hems, especially curved ones, but mostly as a way to add a pop of color to a basic fabric. 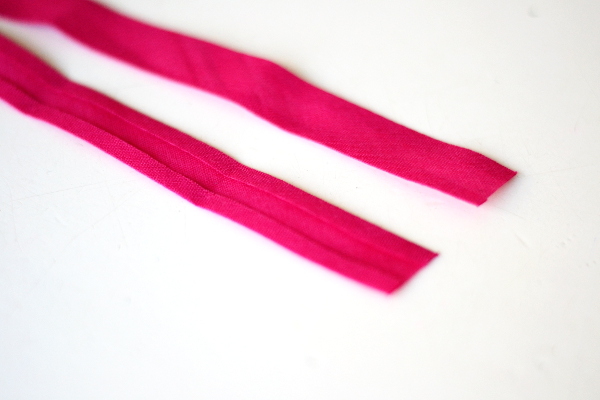 Bias tape comes in multiple widths. As the name says, it is cut on the bias. This means the threads that constitute the fabric are not in the length on the fabric, but diagonal. This way, the fabric adapts itself to curves. The bias cut provides a teeny tiny bit of stretch. 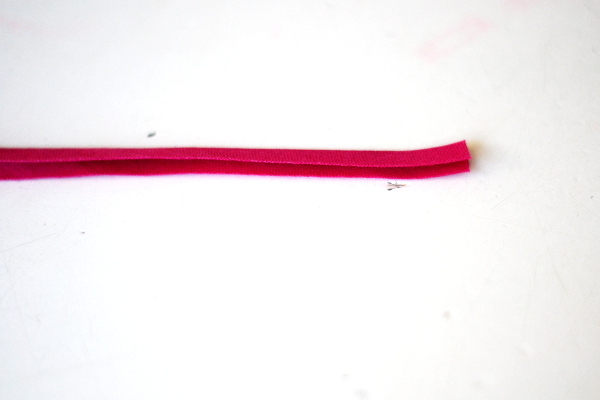 Bias tape usually comes with two folds, as pictured above. 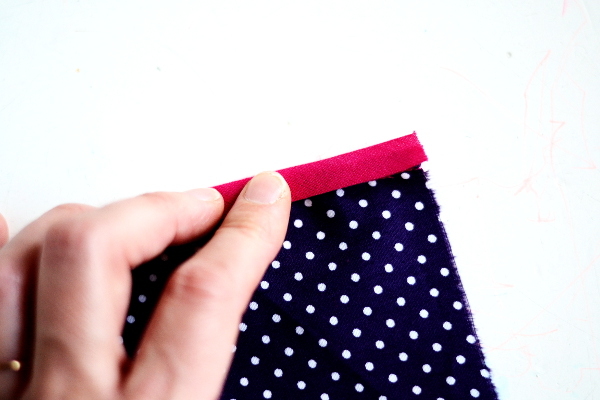 There are many ways to apply bias tape to finish a hem. In this post I’ll walk you through three ways. The first one is the fastest. 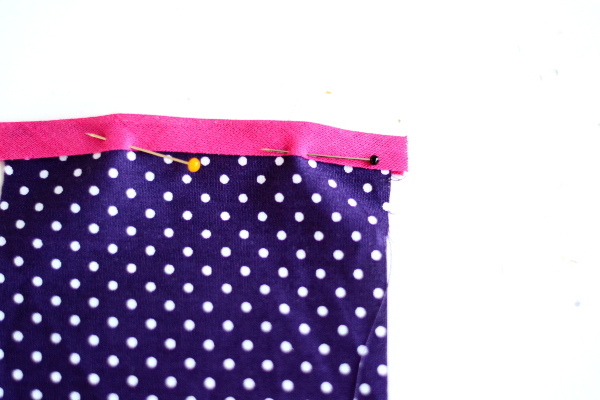 Basically, you press the bias tape in half, fold it over the hem of the fabric and sew. 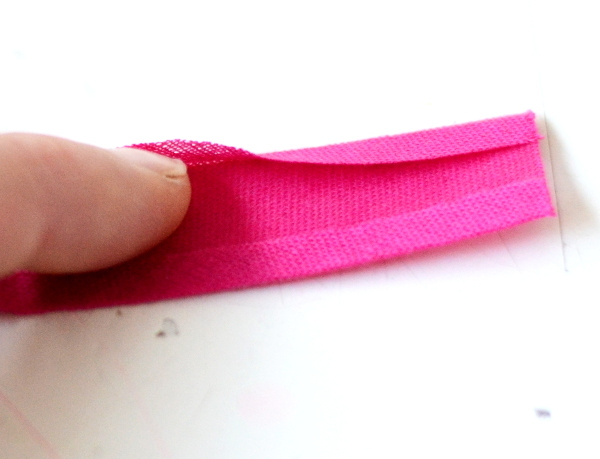 This is very useful when sewing the tape in a basic curve. 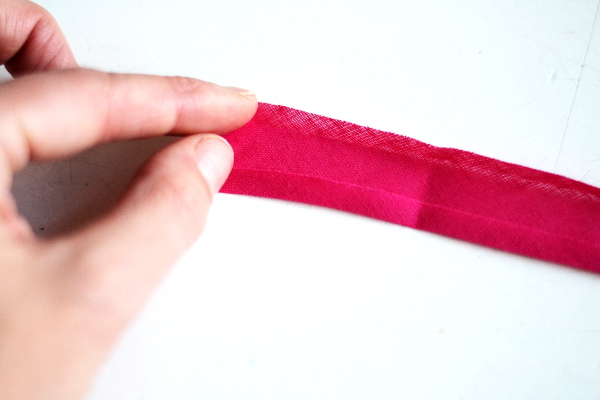 When pressing the tape in half, you can also press it in any desired curve. So, step by step! 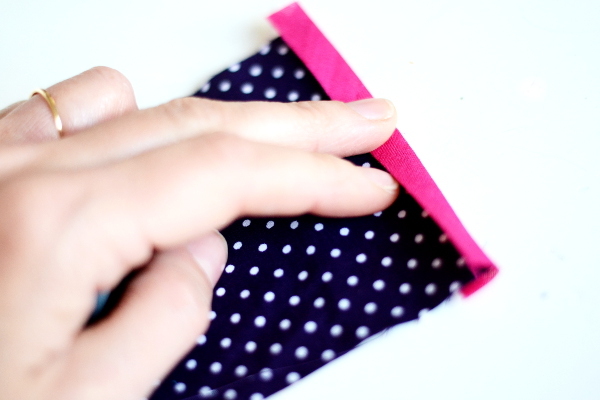 Fold the bias tape double, enclosing the raw edges, and press. 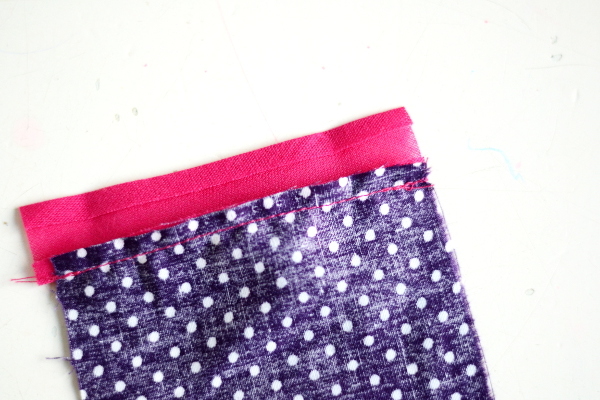 Place the bias tape over the raw edge of the fabric. 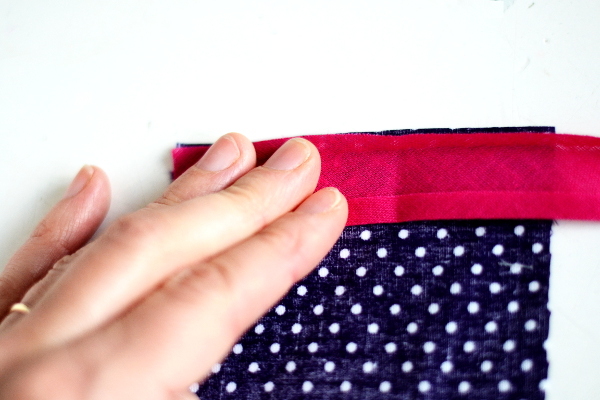 Make sure the raw edge of the fabric is in the pressed crease of the bias tape, so all the way in between the folded tape. 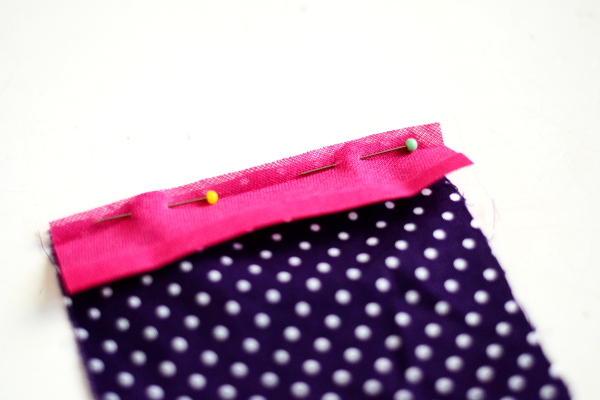 Pin into place, catching both sides of the bias tape and the layer of fabric. 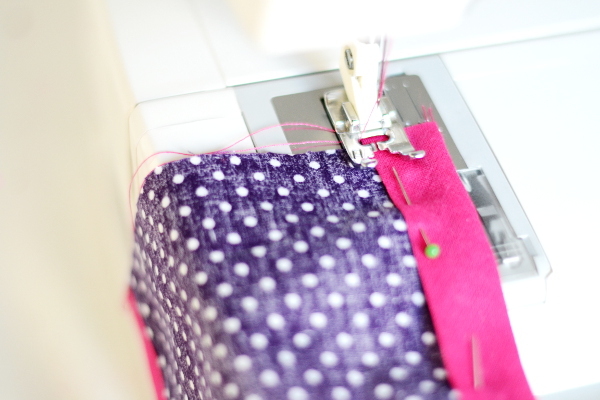 Stitch into place, using a straight stitch. Stitch close to the edge of the bias tape, catching all layers in your stitching. Above the finished hem. Thus the bias tape is visible on both sides of the fabric. 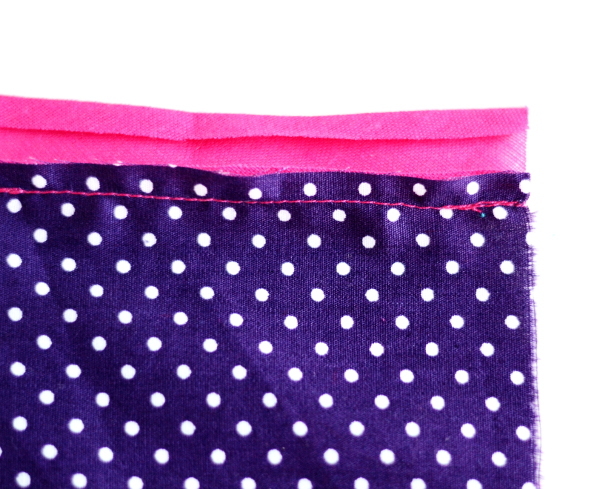 As seen above, the fabric is enclosed in between the folded bias tape. Now off to the next way to attach bias tape. This second way of attaching, has the same end result as the first one. 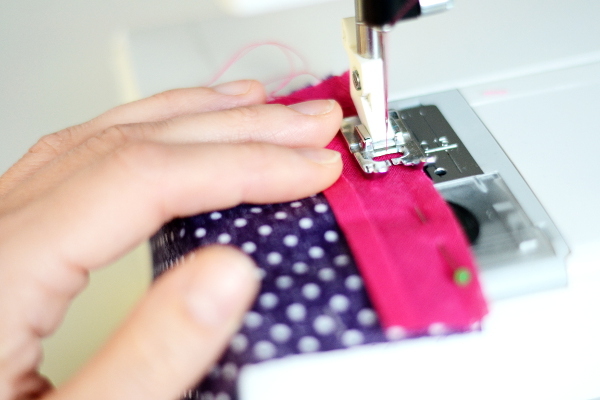 However, this method requires stitching twice. It does give a more accurate result oftentimes – at least for me. 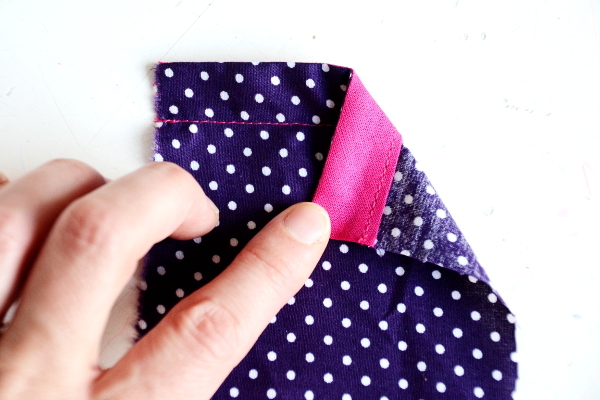 For this method, you open up one of the creases. This is pictured above. 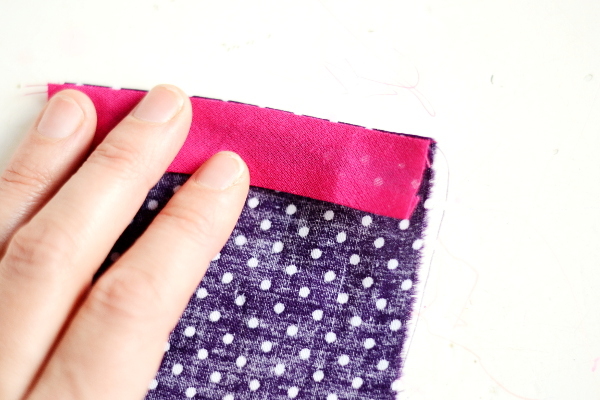 Place the bias tape with the open folded raw edge along the raw edge on the wrong side of the fabric. 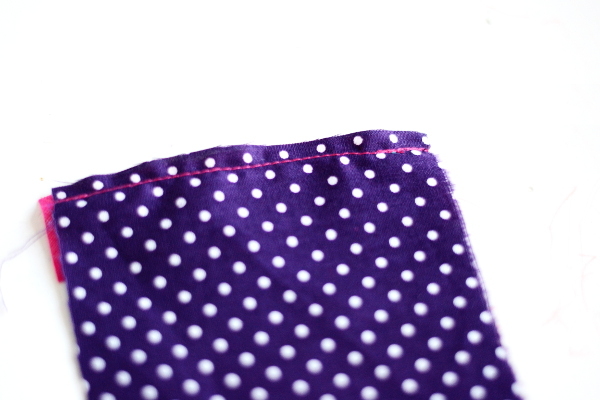 Stitch in the crease of the bias tape. 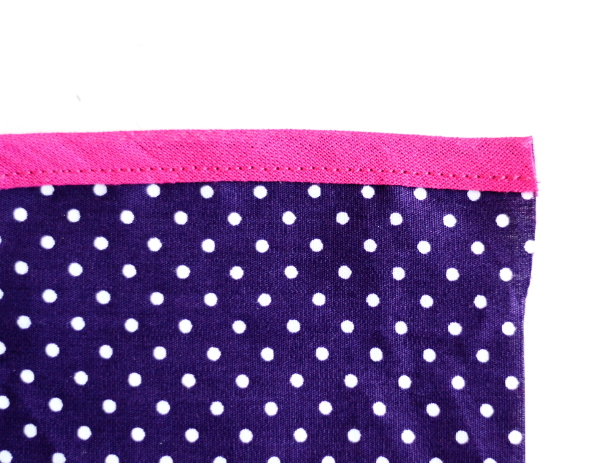 The right side of the fabric should look like the picture above now. 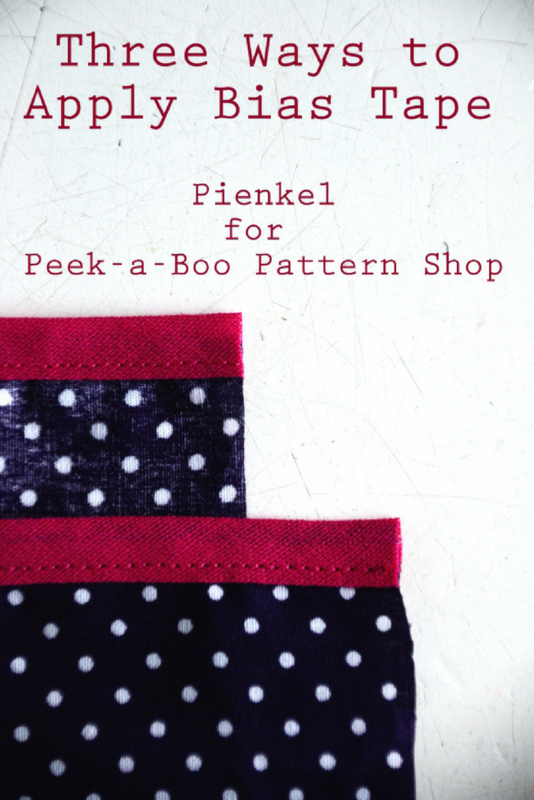 … and fold it over to the right side of the fabric. Make sure it just covers the stitching made previously. 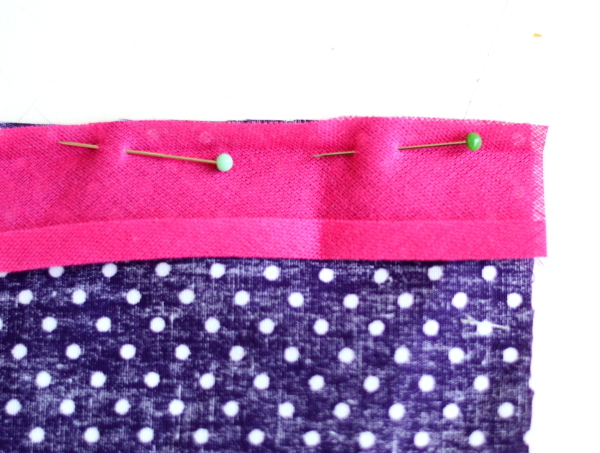 Pin and stitch into place, neatly along the edge. 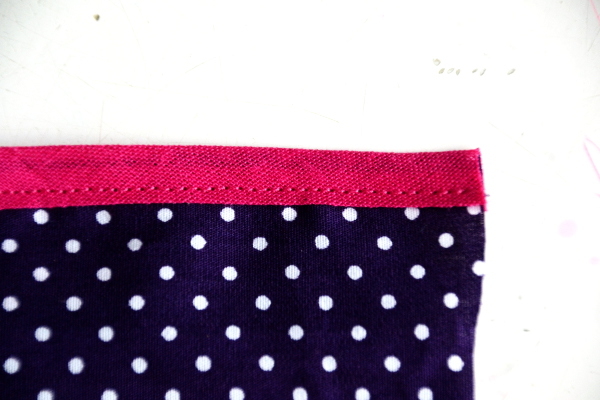 Ideally you should catch the back side of the bias tape as well. This isn’t necessary for keeping it into place, however it does look neat. As you can see in the photo above, if not done very precisely the first stitching can peek out from underneath the bias tape. 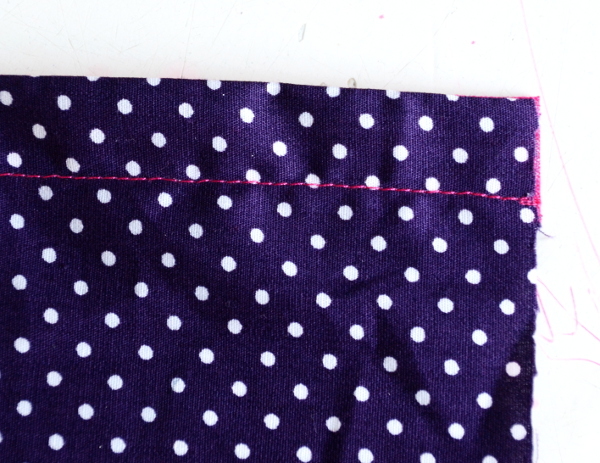 Provided you caught both sides of the bias tape in your topstitching, you can simply seam rip those peeking stitches. Above then how it should look in the end, without any sloppy stitches showing. So front and back of your fabric and bias tape. 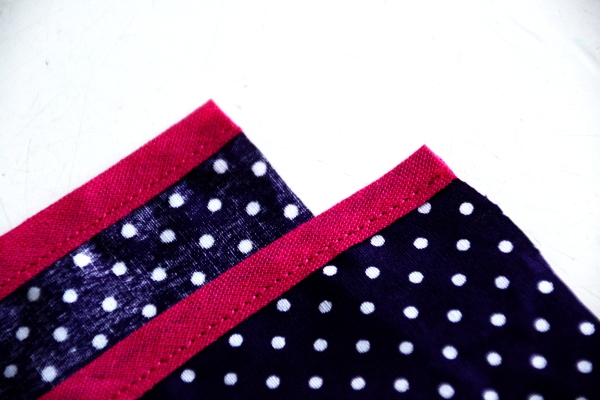 The bias tape should look pretty much identical on both sides. Now off to the third way, which provides a different look! This way, the bias tape is completely at the wrong side of the fabric. Thus it is not visible on the right side. However, this does provide a neat finish, almost like a facing, on some items. Plus, it is easier to hem a curve this way then it would be to really hem it, since the bias tape does adapt to curves easily. 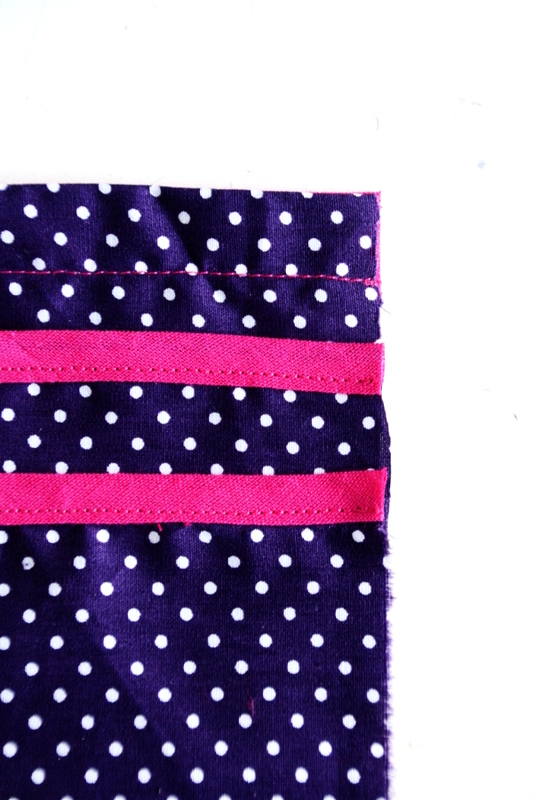 First, open up one folded side of the bias tape, just like you did at the second method. 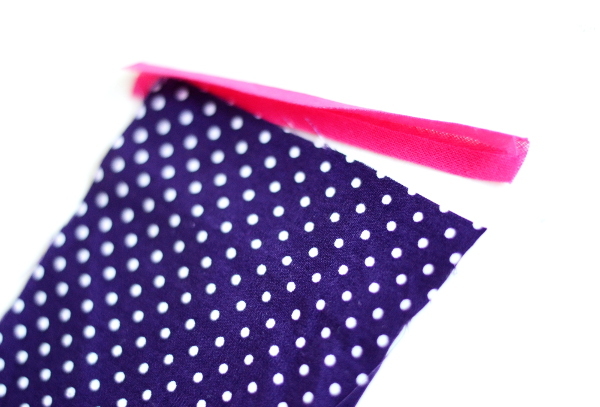 Place the raw edge of the bias tape along the edge of the fabric again. However, place it on the right side of the fabric now. 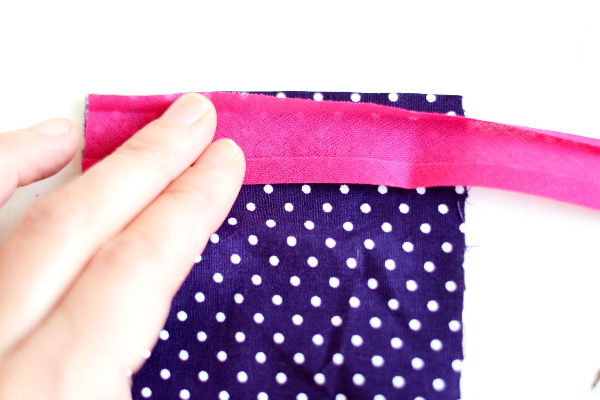 Fold the bias tape up and fold it completely over to the wrong side of the fabric. Stitch into place along the edge of the bias tape. 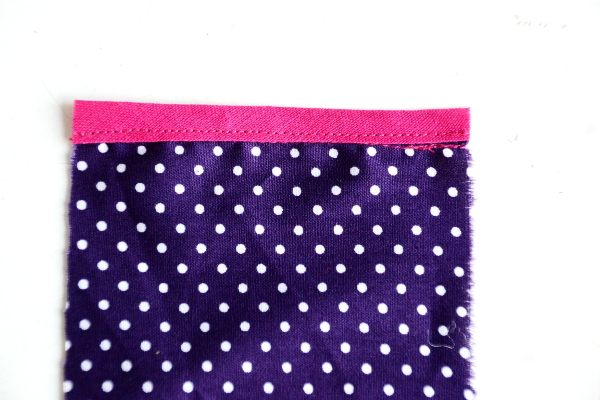 The right side of the fabric should look like the picture above, like any regular wide hem. On the wrong side, the entire width of the bias tape is visible. 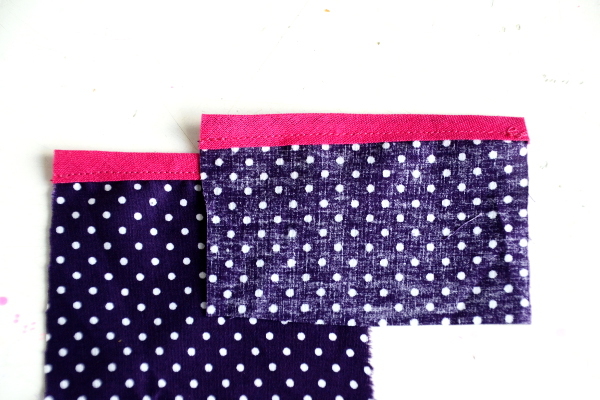 So now you have it: three ways to apply bias tape onto a hem. Which one is your favourite? 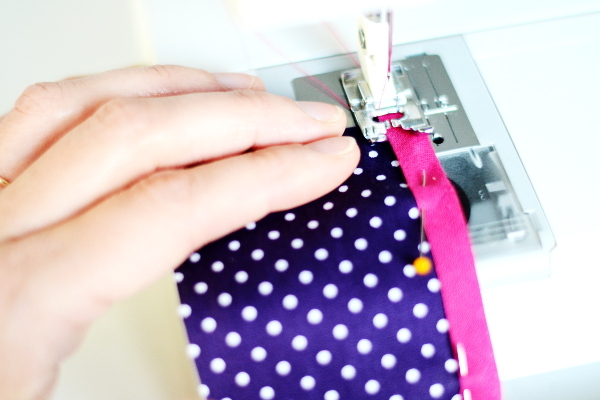 I am new to sewing and your tutorial is excellent! Super easy to understand and very helpful. I’ll be bookmarking your blog and referring back to it, for sure. Thank you for sharing! Thank you Demian, glad it is of help for you! Wonderful! I like all 3 methods although I’d only seen the first 2 in use before today. Thank you SEW much for sharing! Thank you Chelle, glad it has been useful for you!